This page reveals one of my princess tendencies, but hey, we all have priorities! If loud hotel air conditioning drives you crazy too, this information should be appreciated. Unless I’m staying in a particularly dangerous location, I’m only in my room to sleep. After a long day squeezing in all a destination has to offer, a good rest is important. The only thing that prevents this is loud, humming things, usually air conditioning devices. If I’m staying in a hotel in warmer months, or a tropical destination, I do as much research as possible to chose hotels featuring what appear to be updated, quiet units. If the AC unit isn’t visible on the accommodation photos on the hotel’s site, I check the traveler’s shots on Tripadvisor for the hotels I’m considering. What are my criteria? What are the hints that indicate a particular hotel’s air conditioning will enable a peaceful night, or night from hell? If you’re like me, and cannot sleep with vibration or mechanical noises, here is what to look for when booking hotels. 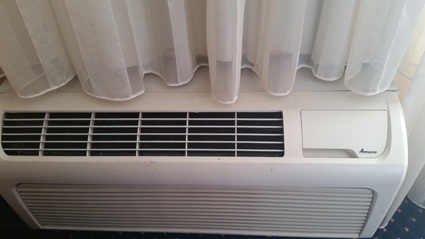 Our list of hotel air conditioner units, which is not comprehensive, follows. Please contact me with information about a particular hotel and I will add it to the list. 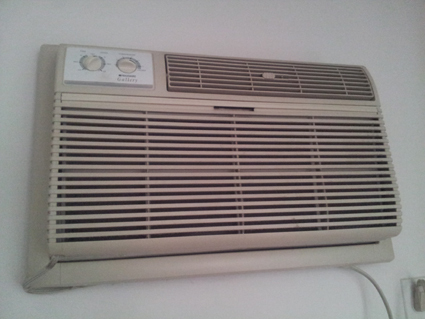 This newer style of air conditioning tends to be the quietest type of unit I’ve experienced. As long as it’s a new model. Usually these units are barely heard; on some settings there’s a little whooshing sound. Usually mini splits come with a remote for easy adjustment. The key to mini-split silence is the noisy part of the unit is outside the building. However, I have been in hotels where the entire unit was inside, making for a very noisy night. I have also been fooled by hotels that had old, squeaky mini-splits, so check the pictures carefully. The hotels with noisy mini splits are notated below. Usually a safe bet, but not always. I’ve been in some hotel rooms with central air that felt like I was sleeping on top of a refrigerated 18 wheeler. In fine hotels, it is usually silent. Unfortunately, these systems vary by building not hotel chain. For example the Club Quarters Philadelphia central air conditioning is rather loud, while being relatively silent at their Chicago Wacker at Michigan location. One clue that the central air will be noisy is the presence of a huge, vertical vent somewhere in the room (see photo to the left). These things tend to click on and off all night. Not being an engineer, I suspect the mechanism is housed in the room, not some central HVAC system. Unfortunately, pictures of these things rarely show up in the professional shots hotels provide, and they’re not the type of thing travelers tend to shoot. From this date forward, I promise to upload pictures of these heinous things to the hotel’s review on Tripadvisor, whenever I encounter one. In a perfect world, I would never book a hotel with a Packaged Terminal Air Conditioner, or PTAC. In the summer or hot locations, I end up turning the thing off and living with whatever breeze comes from the windows. In the winter, they often cannot be turned off and make clicking noises as they go on and off all night – and hum loudly while forcing too much heat into the room. The worst one ever was at a hotel in North Canton, Ohio. When my boss and I compared notes at breakfast, we had both called the front desk in the middle of the night to turn the things off they were so loud and hot. Unfortunately fear of pipes freezing and bursting outweighed our discomfort. The hotel doesn’t seem to exist any longer, probably because no one could get any sleep. Below is a list of all the air conditioner units I can recall from recent travels. Of course, units vary by room and if I’ve stayed in multiple rooms in a property with inconsistencies, they are mentioned. Hotels renovate frequently and all of this information is subject to change. Adaaran Club Rannalhi, Maldives – silent AC in the beach rooms. 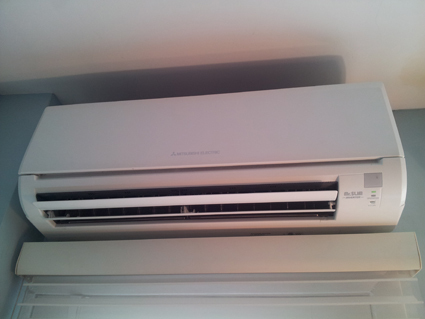 Adaaran Select Hudhuranfushi – silent AC in the beach rooms. All Seasons Resort – Hopkins, Belize. Bandos Island Resort, Maldives – very quiet AC in the gorgeous Jacuzzi Beach Villas. Casa Quetzal, Valladolid, Mexico. Another hotel who fooled me with their mini splits. Not nearly as noisy as Kin Mayab, luckily this hotel is situated around a peaceful garden and I was able to keep my windows open. Cascadas de Merida, Merida, Mexico. Had a quiet mini split in the first room I was in, and one with a slight rattle in the second room. A small piece of paper shoved under the rattling plastic part eliminated the noise but I had to remove and replace it daily. Hacienda Merida, Merida, Mexico. A quiet whoosh is the only sound that emits from this hotel’s new mini-splits. Then again, I stayed there at least 5 years ago. Holiday Inn Resort Kandooma, Maldives – silent AC in spectacular rooms. Hotel Belmar, Isla Mujeres – almost silent in both rooms I occupied during my April 2016 trip. Hotel Bucaneros, Isla Mujeres, Mexico – pretty quiet mini splits in the 2 rooms I checked out before leaving for the much nicer Hotel Belmar across the street. Hotel Chandela, Khajuraho, India – very quiet – I think it was a minisplit or it might have been central air. Either way, this is the best hotel in town. Hotel Cielo, Playa Del Carmen, Mexico. It has been a few years, but I recall having a very quiet mini split in my interior, standard room. Kin Mayab, Cancun, Mexico taught me that all mini splits are not created equal. They probably have the first one ever made. The hotel appears to have a mixture of unit types and I thought I was smart requesting one with a mini split. Luckily I had a window. Luz en Yucatan, Merida, Mexico. My love for this hotel far outweighs a little air conditioning noise. My usual room – the casita – has a perfectly quiet unit but occasionally I end up in another room for a couple of nights and find the units vary in noisiness. Taj Gateway Varanasi, Varanasi, India – silent. I think it was a minisplit or it might have been central. Either way, very quiet. Best Western Westfield Inn, Westfield, NJ. I stayed here in April and didn’t need to use the AC so don’t know how loud it is. Courtyard Marriott Gaithersburg Washingtonian Center, Gaithersburg, MD is a brand new property with relatively quiet units that proved I should be more open minded about the PTAC. Courtyard Providence Downtown, Providence, RI has loud units, but luckily the windows open. On a Waterfire night, it could be loud, but not as loud as the AC unit. Springhill Suites Bakery Square, Pittsburgh, PA. The loud AC was the only thing I didn’t like about this room. Luckily it was cool enough the weekend I was there to go without AC because the windows don’t open and the back of the hotel faces a relatively active bus parking lot. If your trip is during a season when you will not need AC or heat, this is a nice hotel with very personable service. Linq Las Vegas – probably the noisiest air conditioning units I’ve encountered anywhere. Avoid this hotel unless you are a very heavy sleeper not bothered by loud, humming noises. My solution was to upgrade to a suite so the AC was on in the living room and not in the bedroom. Eco-Hotel El Rey del Caribe, Cancun, Mexico has moderately loud wall units. I tried opening my windows, but it was too hot. Fine for a night. This hotel is a peaceful oasis that positions travelers for the bus station but some visitors stay longer. Some rooms are more eco than others with composting toilets and probably no AC. Best Western Campeche, Mexico. So loud I had to leave my windows open. Request a gulf facing room for the breeze. A lovely hotel otherwise. Club Med Turkoise, Providenciales Turks and Caicos. Very quiet. Club Quarters, Philadelphia, PA, USA – central air that is not quiet. This is where I perfected sleeping on my side with the pillow over the exposed ear. Donovan House, Washington DC, USA – silent. 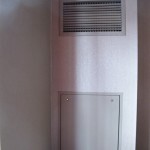 Embassy Suites City Center, Philadelphia, PA – one of the loudest central AC systems I’ve ever encountered. Was at the hotel with quite a few family members for a reunion – and the AC units in almost all the rooms were so noisy most of us had to turn them off and sleep with the sliding glass door open. Excellence Riviera Cancun, between Cancun and Puerto Morelos, Mexico – quiet AC when the Fan was in the off position. Flora Airport Hotel, Kochi Kerala, India – silent central air first trip (2016). Not as quiet in the room I had 2018, but sleep-able. Grand Hyatt Bolgatty, Cochin, India. Silent. You wouldn’t know it was on. Everything is amazing and perfect in the rooms of this brand new hotel, as of September 2018. Hard Rock Riviera Maya Heaven, Puerto Aventuras Mexico – relatively silent in room 2139. This room was opposite a large humming building (HVAC system for the resort) and I couldn’t hear it inside the room. Helix Hotel, Washington DC, USA – quiet AC as long as you’re not on a top floor room under the exhaust fans. If you loved Magic Fingers in 1960s hotel rooms, you might want to request the vibrating top floor rooms. Hilton Rose Hall, Montego Bay Jamaica. AC was quiet in the first room I was in, but it was a King bed for a shared Agent Familiarization trip with a stranger, so I had to be moved to a Double on a lower floor with a louder AC unit. Still able to sleep but it wasn’t as quiet as the first room. Hotel de Nell, Paris, France. Silent. In fact, even the church bells in the church across the street were barely audible. Hotel Giraffe, New York, NY, USA – was there in March but get the feeling from the heat sounds that the AC wouldn’t be silent. Hotel Le Germain-Dominion, Quebec City, Canada. It has been a few years, and name changes since I stayed at this hotel but the AC was silent. Inn at Penn, Philadelphia, PA, USA – central. Most people would find it quiet. Being particularly sensitive, I was aware every time the fan started (and I had my HVAC system turned off as it was a warmish winter weekend). This was the only teeny little thing that bothered me at this otherwise wonderful hotel! Library Hotel, New York, NY, USA – was also there in March and the heating system was silent. Mandarin Oriental, Singapore – silent, as it should be at this level of hotel. Monaco, Chicago, USA – quiet central air, but you can hear the El train in some rooms. Ask for a river view if you don’t mind street noise. 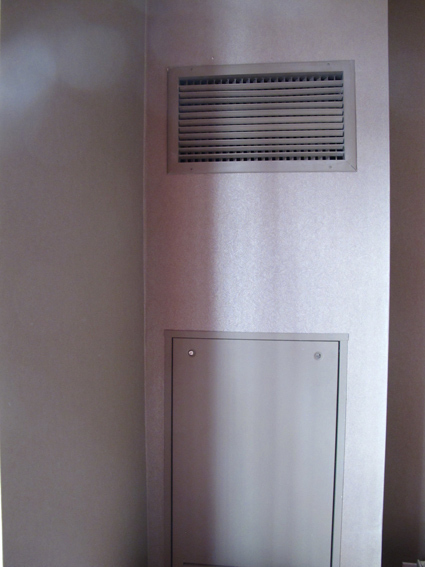 Sunrise section – loud air conditioning in my room and in every other room of people I polled at the conference I attended there, with unit’s Fan in the off position. Nizuc section – very quiet air conditioning in my room 8004, and in my client’s two ocean front Nizuc rooms the week before. Ritz Carlton Dubai, Dubai, UAE. Silent. RIU Club Negril, Negril Jamaica. Didn’t hear a thing. RIU Palace Tropical Bay, Negril Jamaica, also silent. River Royale, Uniworld Boutique River Cruises – stateroom 228. Noticed the hiss the first night; after that I was able to ignore it. Royal Orchid, Jaipur, India – very quiet central air. Siam Heritage, Bangkok, Thailand – looks like it has been renovated since my last stay when the AC was quiet. Trident Gurgaon, Gurgaon, India. Silent. This peaceful oasis is in a suburb of New Delhi. Loved this hotel! Trident Agra, Agra, India. Silent. As I visit or remember hotels, I will add to the above list. Please send me a message via the contact form or add a comment to our post announcing SuitcaseReady’s new feature.